Black and white image of Sarah Bolton, image courtesy of Indiana Historical Society. Women’s rights advocate, poet, and author of “Paddle Your Own Canoe” and “Indiana,” Sarah Tittle Barrett was born in Newport, Kentucky circa 1814. Commonly known as Sarah Bolton, she moved to Indiana as a young child, when much of the state was still unsettled. According to the Life and Poems of Sarah T. Bolton, while growing up on her family’s farm near Vernon, she was exposed to the pioneer experience, living in a log house and clearing the fields. Musical score, 1912, image courtesy of Charlestown-Clark County Public Library, Indiana Memory Digital Collections. In 1831, she married Indianapolis Gazette co-editor Nathaniel Bolton and the couple moved from Madison to Marion County, Indiana soon after. Between 1836 and 1845, they owned and operated a tavern, “Mt. Jackson,” on the National Road. In 1845, the Boltons sold their property to the State and it eventually became the site of the Indiana Hospital for the Insane, later renamed the Central State Hospital. 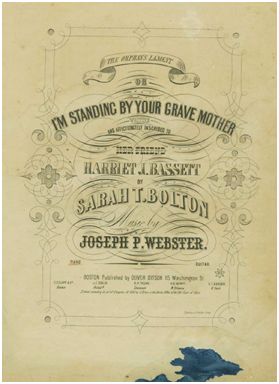 * While in Indianapolis, Sarah’s poetry output continued to increase, and she wrote some of her most popular works there. She lived in the city for many years by the time she became involved in the women’s rights movement. 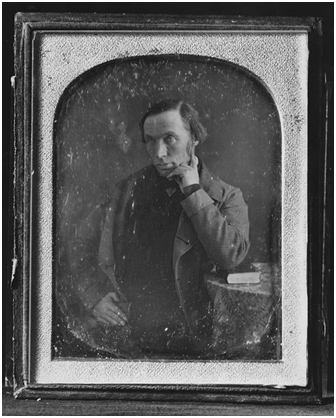 Robert Dale Owen, ca. 1840s, image courtesy of Smithsonian Institution Research Information System. Bolton aided social reformer Robert Dale Owen in his fight for women’s rights of personal property in the 1850 State Constitutional Convention. Owen sought to add a provision to the new constitution that would allow women to retain control of their personal property after they entered into the contract of marriage. Bolton wrote letters to women across the state to build support for the movement, but Owen’s measure was voted down. Orphan’s Lament or, I’m Standing by your Grave Mother, ca. 1855, image courtesy of Indiana Historical Society. In 1855, Bolton’s husband was confirmed as Consul to Geneva, Switzerland, and she spent the next three years dividing her time between Missouri and Europe. She spent her final years, 1871-1893, at her home “Beech Bank” in the community of Beech Grove, focusing on her family and writing. Bolton died August 4, 1893 and was buried in Crown Hill Cemetery. 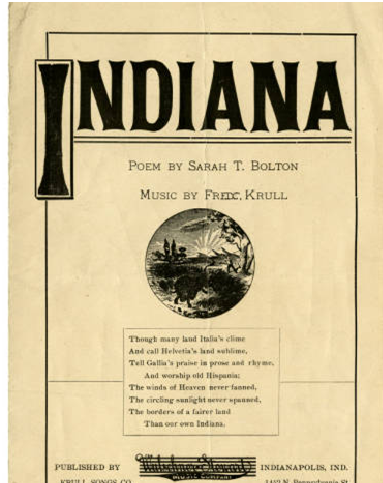 The legacy of the “Hoosier poetess” endures through her poetry, such as “Paddle Your Own Canoe,” which has been translated into several languages and sung around the world. 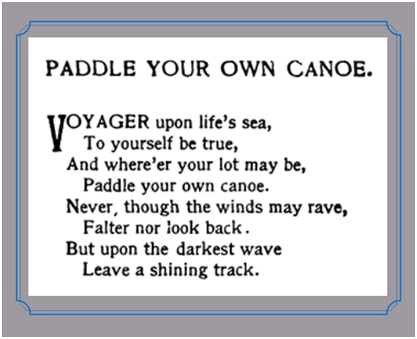 Sarah T. Bolton, Paddle Your Own Canoe and Other Poems (1897), courtesy of Hathi Trust Digital Library. 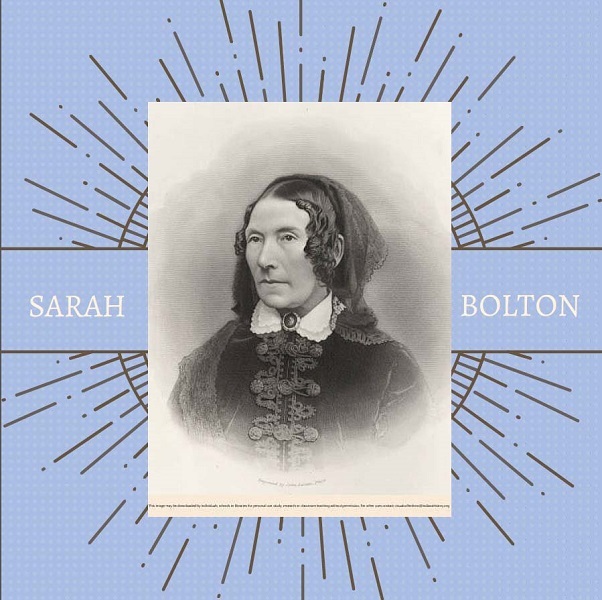 Learn more about Sarah Bolton from the sources cited in this IHB report, and plan a visit to Bolton’s historical marker. *IHB staff is currently conducting research for a Central State Hospital marker. Stay tuned to learn more!